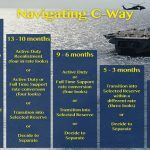 The Navy announced guidance streamlining the transition from active duty to Selected Reserves (SELRES) through Perform to Serve (PTS) or Early Career Transition Program (ECTP) in release back in June. “This process will take an active duty Sailor affiliating with the SELRES from their current assignment to their NOSC without a break in service,” said Mack. The CTO was established under the Navy’s continuum of service initiative to ease the transition of personnel from active duty to Reserve billets, decrease transition processing times and error rates, and increase Reserve affiliation among qualified Sailors leaving active duty. Since it’s inception CTO has assisted 1,021 enlisted Sailors with their transition from the active duty to the Reserve component.